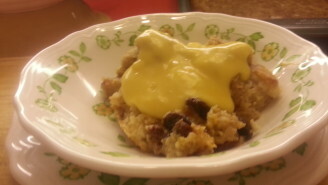 NOTE: This warm bread pudding will take you back to Grandma’s house with memories long remembered. 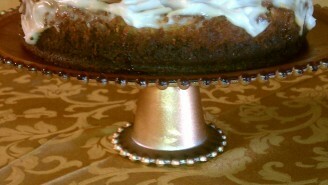 There is nothing like a bowl of warm bread pudding laced with cinnamon and raisins. NOTE: This is the perfect cheesecake for your Thanksgiving table and it is so beautiful, you can use it for your centerpiece. To say that it is delicious is an understatement. 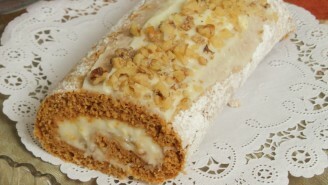 NOTE: This pumpkin cake roll is so delicious, it can only be explained by one bite. 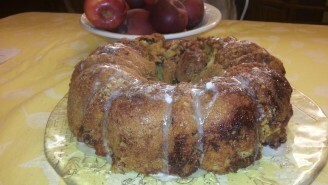 NOTE: This cake is full of the October flavor with lots of cinnamon, fresh apples, and a crunch of walnuts and raisins. You will absolutely love this cake. 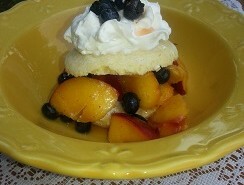 NOTE: A great treat in early and mid-summer when peaches and blueberries are sweet and plentiful. This homemade shortcake is quick and easy to make with a wonderful light taste. NOTE: This is the recipe that my husband, Bill, uses every year from early spring to start of fall. 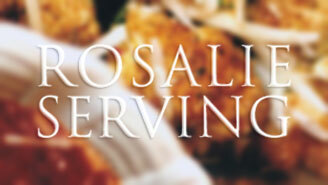 It is truly a mouth-watering experience and great for any barbecue. Use chicken breasts and legs for the best grilling. NOTE: This was my mother, Ann Fiorino’s, version of potato salad. It has been handed down to her daughter and granddaughters. The sweet-sour syrup really sends this on over the top. Everyone will love this! 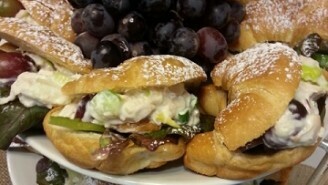 NOTE: These beautiful little croissants are filled with a crunchy chicken salad loaded with purple grapes and sugared pecans. They are perfect for your next bridal shower.